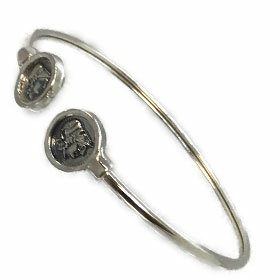 An elegant sterling silver cuff bracelet featuring Goddess Athena at each end. Pallas Athena was second to Zeus in wisdom. Athena Goddess was the patroness of Athens and all the heroes who fought against evil. Athena Pallas loved peace more than war and was also known as Goddess Athena of agriculture, and spinning and weaving.